Yesterday was my birthday and I always get a card from my ‘kids’. This year’s card was extra special. 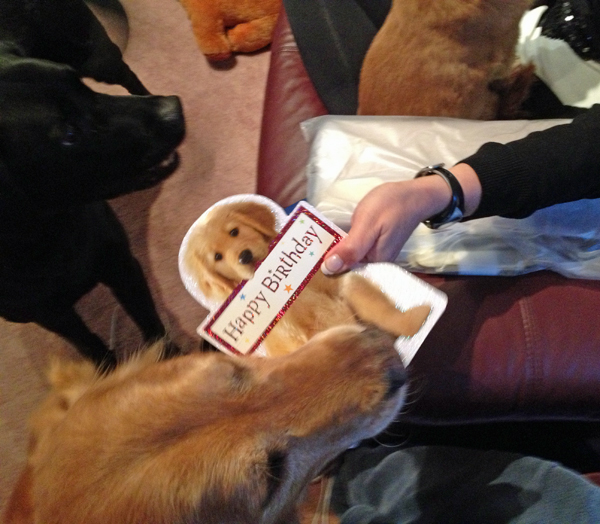 Not only did it have a picture of a beautiful Golden Retriever on the front but it was hand delivered, actually mouth delivered, by an even more beautiful Golden Retriever…..my boy!!!! HAPPY BELATED!!!!!! I am a day late and a dollar short!!!! hope this year brings your all the things you wish for!!!! Cheers!!!!! Happy Birthday! Just love the picture!